McKinley Elementary School will grow by about 241 seats thanks to a $20.5 million expansion approved by the Arlington County Board at its meeting on Saturday. The expansion will add a 33,040-square-foot addition in the northeast corner of the school, at 1030 N. McKinley Road, and smaller additions in the southwest corner and at the main entrance to the school. The project is expected to be complete by the beginning of the 2016-2017 school year. An expansion of this size would, according to the county’s Zoning Ordinance, necessitate that Arlington Public Schools add 108 parking spaces. But because open space and a number of mature trees surround McKinley, the County Board approved plans to add just 20 spaces to the existing 36 spaces. Even those 20 spaces were the source of controversy; the county’s Planning Commission and Transportation Commission recommended adding no spaces and instead using street parking to accommodate the additional staff and parent vehicles. Advocates from the school and community who were a part of the planning process, including McKinley Principal Colin Brown, spoke in favor of adding the 20 spaces. Ultimately, County Manager Barbara Donnellan recommended keeping the 20 spaces in the plan, and the County Board approved it unanimously. Only three members of the general public spoke, two of whom, School Board candidate Audrey Clement and Jim Hurysz, decried APS’ inability to expand schools “up, not out,” which would save green space. 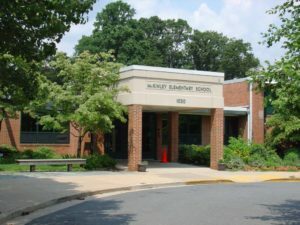 Despite that opposition, County Board Chair Jay Fisette marveled at the lack of animosity toward the plan, which marked the expansion of Ashlawn Elementary School. To make way for the school expansion, 78 trees will be removed — 12 of which are gingko trees that will be transplanted elsewhere in the county. Nearly 150 trees will be planted once construction is complete, according to APS Director of Design and Construction Scott Prisco. “We feel strongly this is a sensitive approach to the neighbors, and it will meet our needs as a school system,” Prisco said. In total, the expansion will mean a net increase of 32,250 square feet and include 10 new classrooms, two art rooms, two music rooms and expand the gymnasium to have enough space for the entire, expanded school. The expansion will also add a stage. Construction will include pedestrian improvements on N. McKinley Road and 11th Street N.